Vancouver is often critiqued for its boring architecture. 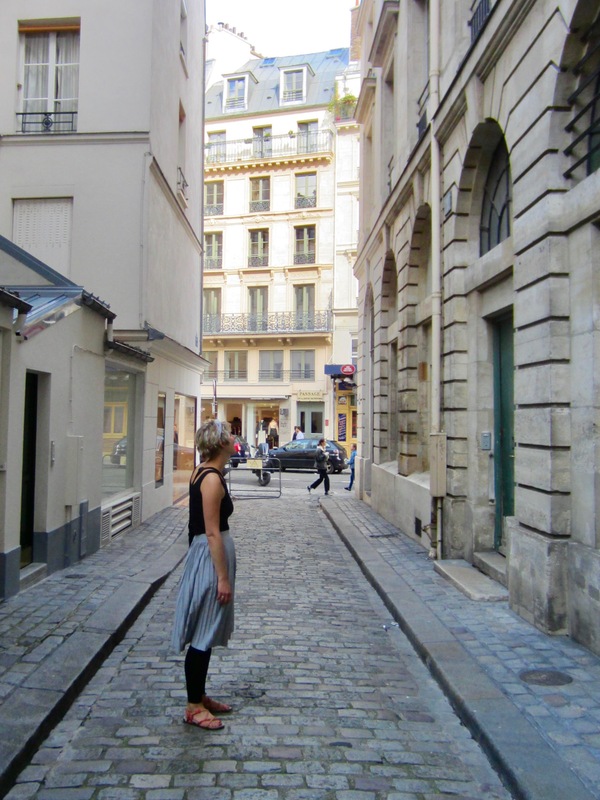 As a young city born in 1886, it doesn’t have the same rich architectural history, as say, places like London or Rome. Much of Vancouver’s skyline is homogenous: seafoam green and glass office buildings. 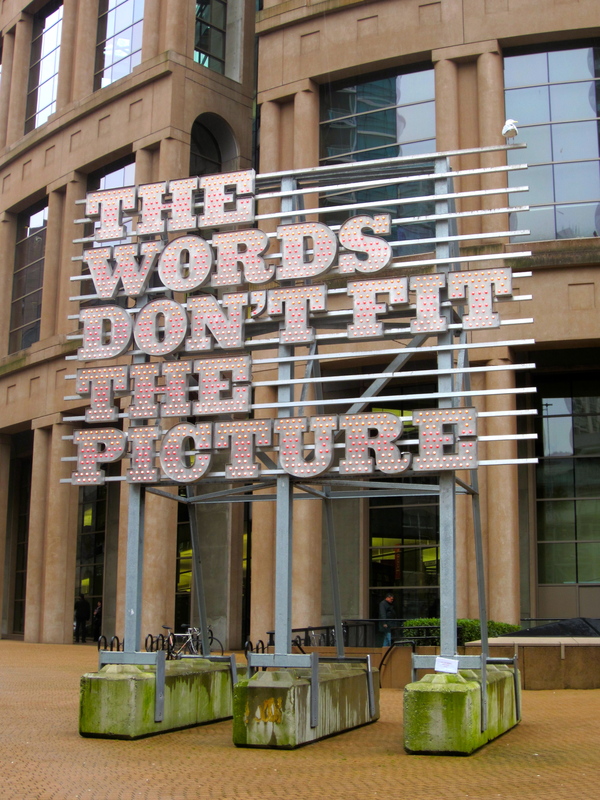 Hence, the title of Douglas Coupland‘s ode to Vancouver, City of Glass. 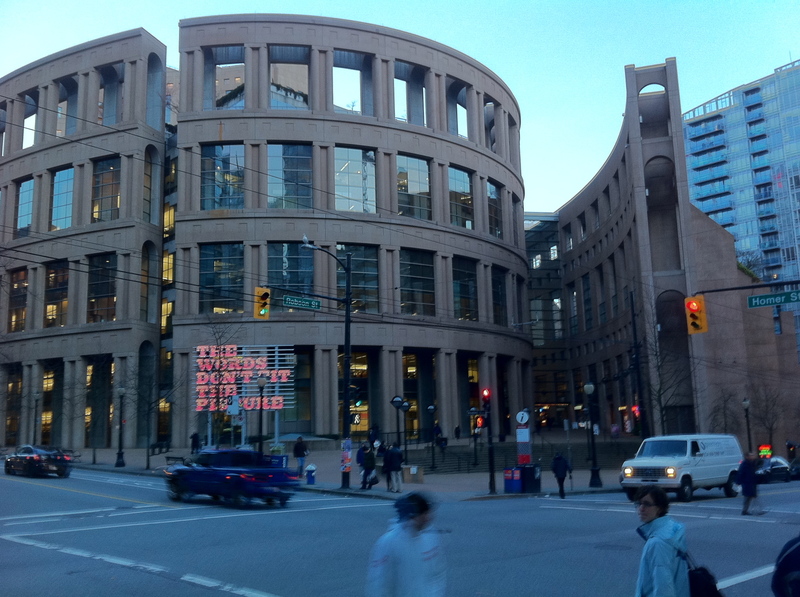 The Vancouver Public Library is an exception to this rule. For the city’s most important cultural building, architect Moshe Safdie takes you back to 1st century Rome, to the days of the Colosseum. 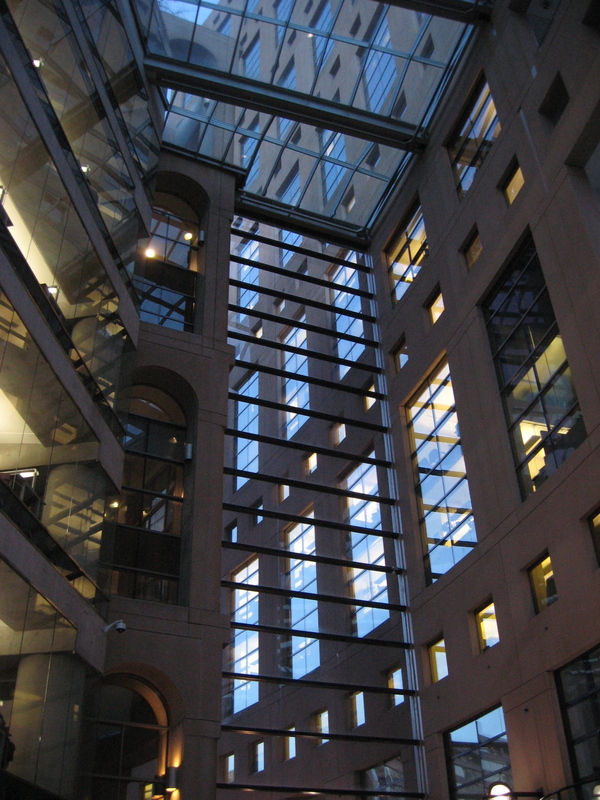 The Vancouver Public Library is an oval- shaped building adjoined to a federal office tower with retail and service facilities on the ground floor. 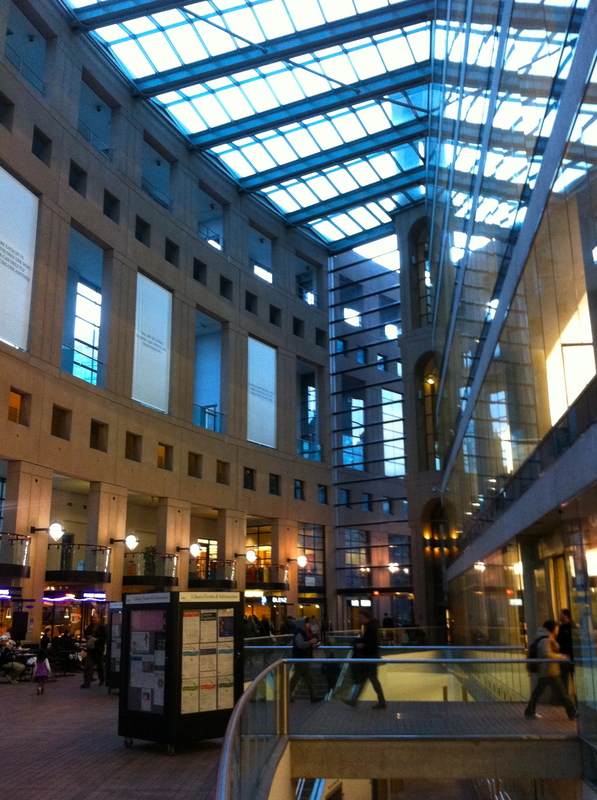 (It was mentioned here as one of the top 8 beautiful libraries in Canada). Windows flood the space with light. “Drawbridges” or walkways connect the book stacks with study carrels that line the oval perimeter, offering each seat a spacious window, much better than the library I talked about here. 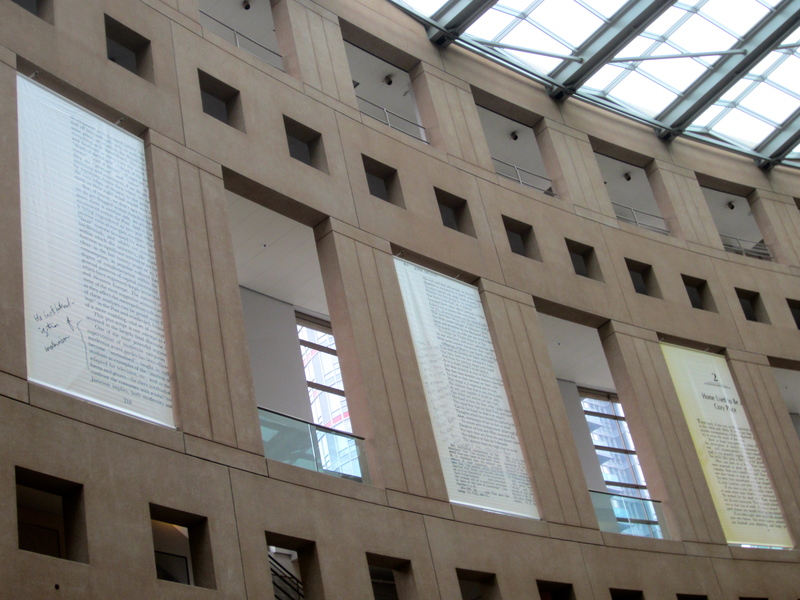 Ironically, the Vancouver Public Library alludes to the past and yet its form is decidedly postmodern. Built in 1995, it plays with history divorced from context, as postmodernist architecture often does. What does a Colosseum and a public library have in common? Architectural critic Trevor Boddy answers “shameless populism” in the book Vancouver: Representing the Postmodern City. Yet is populism so bad, especially for a civic institution designed to serve the public? And considering the public library was the result of a rare competition where the public had a say in the winner, this building was democratic from the start. Regular public events and art installations happen in and around the building, contributing to an engaged civic and cultural space. The human installation, “Sometimes I think, I can see you” was presented by the PuSh International Performing Arts Festival earlier this year. Writers were set up in the atrium of the library with laptops connected to a large projection screen where passersby could read the spontaneous fictions the writers created about their surroundings – fictions that might include you or I or whoever happened to be in that space at that particular time. Public spaces like library atriums are great places for people watching as it is. Argentinian artist Mariano Pensotti amplifies their voyeuristic quality by recording the thoughts of strangers as public text for all to see. I spy with my little eye . . . Given the 21st century context where traditional publishing companies battle with e-books, closing prominent presses (most recently Douglas & McIntyre in Canada) and threatening the future of libraries, the Colosseum reference is not so out of context. The printed word is struggling to survive, to find a place to call home. Maybe Moshe Safdie’s vision for the building was more prescient than he knew: futuristic more than historical. Maybe the texts do fit the context. Maybe the words do fit the picture.